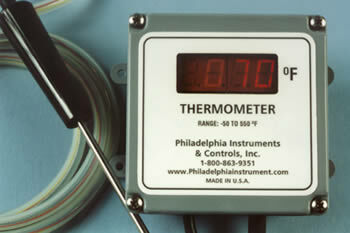 Digital Thermometer - Philadelphia Instruments and Controls, Inc. - Specializes in the production of temperature related products. These thermometers are housed in sealed enclosures suitable for use in high humidity places. Meters come complete with permanently attached probes calibrated to provide matched accuracy. These probes are constructed of tough, long-life materials, and can be custom optimized to meet specific customer requirements. Typical monitoring applications include batch cooking of fudge, hard and soft candies and any product where the processing temperature is critical. Built-in quality gives these instruments an excellent combination of accuracy and durability. Thermocouple type K wire is used because of it superior mechanical strength and corrosion resistance. Heavy-duty probes are designed for use in batch production applications. Long flex-life cables are steel reinforced and are jacketed for either cold or hot environments. Large bright red LED display is about 1/2" high for excellent readability. Individual digits are mounted in sockets for simple replacement. Based on calibration and probe construction range is -50 to 550 °F (-45 to 288 °C). ±1 degree from -30 to 400 °F using NBS traceable references in calibration baths. Accuracy to the extremes of the range is ±2° F.
-10 to 120 °F (-23 to 49 °C). One degree max. for an ambient range of 0 to 120 °F. PVC molded 4" x 4" x 2½" splash proof enclosure. Exposed hardware is stainless steel. Supplied with a 5ft power cord for 120 VAC 50/60HZ. Appx.1.2 lbs (0.54 kg) without probe.